Fraser, S. and Seear, K. (2011). 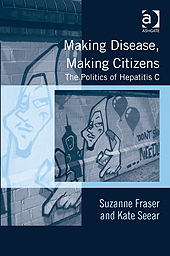 Since the naming of hepatitis C in 1989, knowledge about the disease has grown exponentially. So too, however, has the stigma with which it is linked. Associated with injecting drug use and tainted blood scandals, hepatitis C inspires fear and blame. Making Disease, Making Citizens takes a timely look at the disease, those directly affected by it and its social and cultural implications. Drawing on personal interviews and a range of textual sources, the book presents a scholarly and engaging analysis of a newly identified and highly controversial disease and its relationship to philosophies of health, risk and harm in the West. It maps the social and medical negotiations taking place around the disease, shedding light on the ways these negotiations are also co-producing new selves. Adopting a feminist science and technology studies approach, this theoretically sophisticated, empirically informed analysis of the social construction of disease and the philosophy of health will appeal to those with interests in the sociology of health and medicine, health communication and harm reduction, and science and technology studies.